Depending on where you live, there’s a good chance that you have hard water coming through your faucets. But what exactly is hard water and is it harmful to people? We’re here to provide you with some important information that may change the way you consume water. In general, if water is hard that means it contains various minerals found in the ground. These include things like magnesium and calcium, and while some amounts of these minerals can have positive effects on your health, too much of a good thing is usually bad. 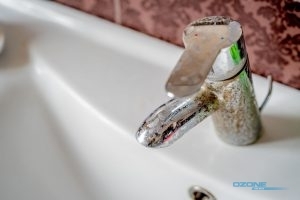 You may have been drinking hard water for years and not had any problems, or you may be suffering from health issues that you didn’t even realize were being caused by hard water. Some of the side effects of ingesting too much of these minerals could include vomiting, fatigue, and even potential digestive problems. Hard water isn’t just responsible for causing damage to people. It can cause damage to your property as well. Mineral deposits can build up in your pipes and faucets, limiting water pressure and flow and potentially causing major problems. In some cases, these deposits could lead to damages and costly repairs. The good news is that if you have hard water coming through your pipes, you don’t have to settle for it. Water purification and filtration devices can go a long way towards ensuring your water is soft and free of minerals, as well as other types of debris. If you’ve noticed any signs of hard water in your home, consider purchasing a purification device today. Posted in Uncategorized on March 16, 2018 at 8:00 pm by Ozone Pure Water.